A sequel to the popular Mount & Blade game series, which skillfully combined action with strategy and RPG elements. The sequel was developed by the creators of the original game – Turkish developer TaleWorlds. 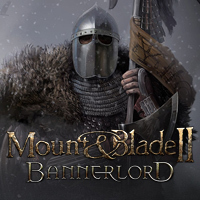 Mount & Blade II: Bannerlord is a full-fledged sequel to a popular game series that combines elements of action, strategy, and RPG. This title was created by the authors of the original game and its many expansions – Turkish studio TaleWorlds. The game is set 200 years before the events depicted in Mount & Blade: Warband, in a mighty realm of Calradia, whose king died without having a rightfull heir. Anarchy spread across the land, and trade routes became plagued by bandits, nomads, and mercenaries. Fortunatelly for the country, standing on the brink of collapse, the player steps in. The role of the protagonist is to find his place in this complex political situation, subdue defiant nobles, and restore the former glory to the land as a leader of one of six available factions. The overall premise of Mount & Blade II doesn't deviate from what we saw previously. Therefore, the story is just a background for extensive gameplay, once again split into two layers: strategy and action. As you play you move around a vast map of a virtual realm spanning across 230 square kilometers. You recruit warriors and adventurers in local inns, and buy food and water for your party from villages. Apart from performing story-related missions and a whole bunch of side quests, the core of gameplay consists in waging multiple battles, in which you personally command an army in over-the-shoulder view. The second part of the Mount & Blade series brings about numerous improvements and modifications, which further emphasise the sanbox structure of the game. E.g. the character editor was expanded to let you adjust almost every element of the face and appearance of your hero. The game is introduced by a much better tutorial, which is now more dynamic and compelling than previously. Among other improvements that are worth mentioning, there is greater depth of individual characters – each of them has their own background story and profession, which may prove essential for the entire party. The game world has a life on its own – the people you meet are busy doing their daily jobs or performing various activities. Mount & Blade II offers a much more expanded management of your lands (you can impose taxes on them, train warriors, assign men to construction sites, etc. ), as well as an autonomic trade system that reflects supply and demand. On top of that, there is a complex crafting system, which allows you to forge your own unique blade choosing its statistics and appearance. Compared to its predecessors, Mount & Blade II boasts notably enhanced audiovisuals, as its based on a brand new proprietary game engine. The improvement is visible in appearance and interactivity of locations, as well as in battles – especially those with many warriors involved (e.g. sieges). Battles are influenced by factors such as time of year and changing weather. Moreover, each skirmish can be closely analyzed with the use of an impressive replay system. Of course, the developers did not forget about the modding community, providing the players with a powerful, multi-layer editor. Expectations: 9.6 / 10 calculated out of 8520 players' votes. TaleWorlds showed us how to conquer strongholds in Mount & Blade II: Bannerlord while they visited E3. The game will introduce lots of novelties, but it will stay true to the spirit of the original game. Mount & Blade II: Bannerlord First Look. Could it be the perfect sequel? The development of Mount & Blade II: Bannerlord began five years ago, and its creators have finally shown us the game in action. It looks much better, especially during town sieges, and features a brilliantly simple terrain builder.